Francesca Simpson is a young, self-taught artist from Northumberland who works primarily in acrylic on canvas but is equally well-known for her detailed biro drawings. 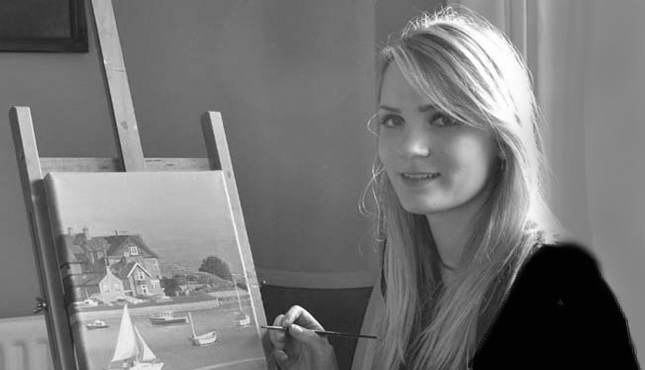 The current focus of her work is representational landscape painting inspired by rural Northumberland. Also an accomplished pianist, Francesca completed a Degree in Music Performance at the Royal Scottish Academy of Music and Drama in 2010 but since graduating has been working as an artist. A bright snow scene depicting Alnmouth village from the beachFormat: Limited edi..
Wintery depiction of Alnmouth beach, subtly featuring St. John the Baptist Church and rooftops in.. Cold and stormy painting featuring Coquet Island, viewed from Alnmouth Beach.Format: Li..
View of Coquet Island from Alnmouth beach on a cold, stormy morning. This limited edition print w.. Dark, moody seascape portraying sunrise at Alnmouth Beach. A single ray of light breaking through..
Sheep grazing at Ingram Valley on a sunny day in spring. This limited edition print was mad.. Tranquil depiction of Inner Farne at first light. Viewed from Bamburgh Beach.Format: Li..
Stylized painting of Mount Pleasant in Alnmouth inspired by Frederick Gore’s paintings of Majorca..